In the evening on Saturday, February 2, the next group of pro-lifers, this time from the dicese of Berez de la Frontera, took over the care of the Icon of Our Lady of Częstochowa. At 5 PM they reached the capital of the diocese Jerez de la Frontera, the town in the south-west of Andalusia. This city, with 200 thousand inhabitants, is particularly famous for sherry production. The Black Madonna of Częstochowa was welcomed at the entrance to the cathedral. Next She was led into the church and placed in the presbytery. The Holy Rosary in the intention of the defence of life and family was said. Around 200 people attended it. 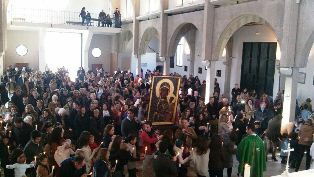 From 6.PM various church groups led the prayers before the Icon. At 8.30 PM bishop Jose Mazuelos Perez presided over the solemn Holy Mass in the cathedral. During the homily he strongly stressed the need to convert ourselves in the spirit of faith. After the Holy Mass the Mother of God went in a solemn procession into the streets of the city of Jerez to the chapel of St. John where adoration was held throughout the night. On Sunday, February 3, they celebrated the Feast of The Presentation of the Lord which was transferred to Sunday. In the morning at 8.30 AM at the chapel of St John the Holy Mass was celebrated and next the Częstochowa Icon was taken to the town of Villamartin at the very centre of Sierra de Cádiz (the Cadiz Mountains). She was awaited by the Pastor of the parish, who led Her into the church of the Most Holy Virgin Mary, the Example of all Virtues. About 400 people attended the solemn Holy Mass at 11 AM. The pastor stressed during his sermon that abortion is the murder of the conceived child and it cannot be called a routine medical intervention. After the Holy Mass a procession started to the Shrine of Our Lady of the Mountains. The Częstochowa Icon was welcomed by a huge crowd of people. According to old local tradition on this day, the Feast of Presentation, the local mothers bring to the shrine their children who have been born during the year and present them to the Mother of God. About 800 people attended the Holy Mass. Most of them were families and mothers with children. After the Holy Mass a group from the neighbouring town of Prado del Rey led the Holy Rosary in the intention of the defence of life and family. Next, according to tradition, mothers with little children approached the Częstochowa Icon and the statue of Our Lady of the Mountains to present their children to the Immaculate. The vigil lasted till 5 PM when they started to form a procession. During the farewell ceremony young people played the traditional guitars and flamenco music was heard. The Mother of God went again into the central streets of Jerez to the Seminary. The seminarians carried the Icon into their chapel where they prayed till 9.30 PM. Next the Mother of God went by Her Life Mobile to the convent of the Carthusian Nuns. The Icon was taken to the chapel of the order and placed in darkness, with the only lights lit at the image. The vigil was presided over by bishop Jose Mazuelos Perez. The faithful left the convent at midnight, but the sisters kept vigil at the Icon throughout the night. On Monday morning at 8.30 AM bishop Jose Mazuelos Perez presided over the Holy Mass at the chapel of the Carthusian Nuns. During his homily he invited all people from his diocese to pray together in the intention of the defence of life.